ENVI Py for ArcGIS provides a Python client library named envipyarc to run ENVI analytics through ArcMap™ and ArcGIS Pro. To use ENVI for ArcGIS full interoperability, ENVI 5.4 is required. Start a Windows command prompt in administrator mode. Close the windows command prompt. 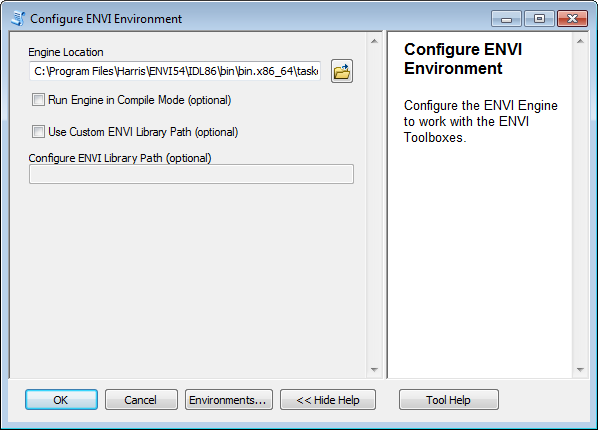 In the Catalog window, select Toolboxes > System Toolboxes > ENVI Management Tools.pyt > Configure ENVI Environment. If this file does not appear in System Toolboxes, connect to the folder located at C:\Python27\ArcGIS10.x\Lib\site-packages\envipyarc\esri\toolboxes\ and run it from there. Enable the Run Engine in Compile Mode option if you want to compile .pro files. This depends on what your ENVI license allows. If you disable this option, the ENVI code you want to run must be packaged as IDL SAVE files (.sav). 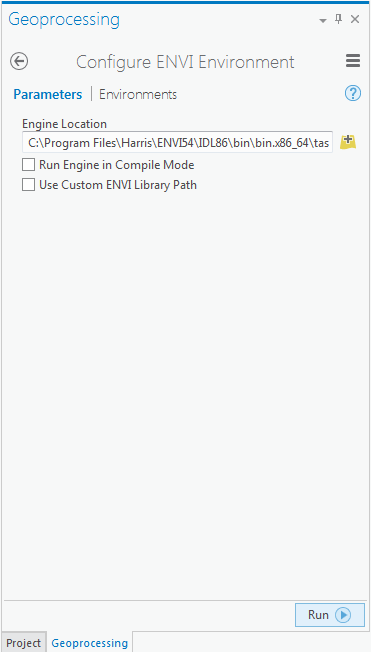 Enable the Use Custom ENVI Library Path option to specify one or more directories that contain custom ENVI code. Then enter the path to the directories in the Configure ENVI Library Path field. Use a semicolon to separate individual directory paths. Click OK to run the tool and save the environment. From the Windows start menu, select ArcGIS > ArcGIS Pro > Python Command Prompt. Be sure to run this as an administrator. Close the Python Command Prompt. Click Select another project template. Select New > Computer and click the Browse button. Enter a name for your project and click OK. In the Project pane, select Toolboxes > ENVI Management Tools.pyt. 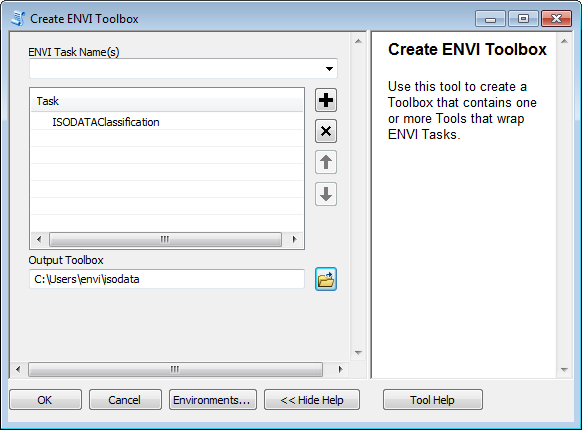 Expand the ENVI Management Tools toolbox, and double-click the Configure ENVI Environment tool. In the required Engine Location field, enter the full path of the ‘taskengine.exe’ in your ENVI distribution. The default path is <ENVI_INSTALL_DIR>\IDLXX\bin\bin.x86_64\taskengine.exe. An ENVI Management Tools toolbox provided as a system toolbox for ArcMap. An ENVI Py Management project template containing the ENVI Management Tools toolbox for ArcGIS Pro. A command-line tool, named createenvitoolbox, provided in the Python scripts directory. A Python package named envipyarc. The options are described next. 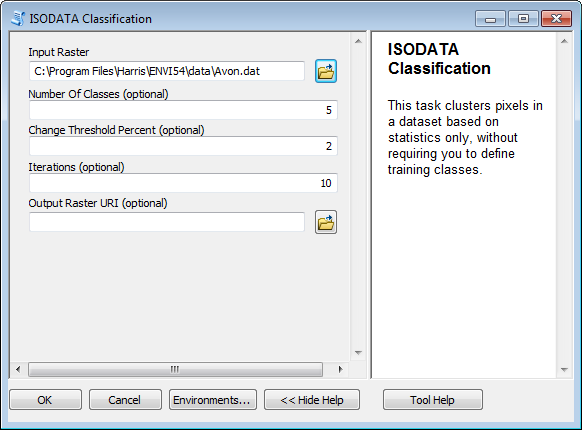 In the Catalog window, select Toolboxes > System Toolboxes > ENVI Management Tools.pyt > Create ENVI Toolbox. In the required ENVI Task Name(s) field, enter one or more ENVI tasks to be wrapped into a GPTool. Click the + button to add the tasks to the Task list. In the required Output Toolbox field, specify a location to create the toolbox. Click OK. After the toolbox is created, navigate to the location specified in Output Toolbox. Double-click ISODATAClassification. The ISODATA Classification tool appears. 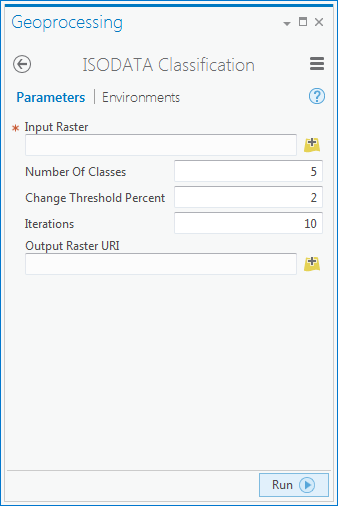 In the required Input Raster field, select an input raster dataset. Click OK. When processing is complete, the result will display in ArcMap. Open the project you created earlier in the Installation section. 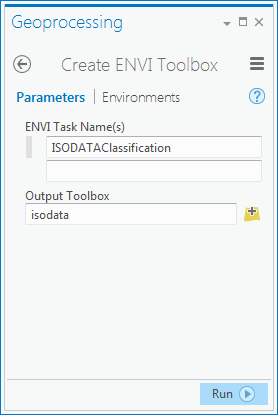 In the Project pane, select Toolboxes > ENVI Management Tools.pyt > Create ENVI Toolbox. Click Run. When processing is complete, use the Project tab to navigate to the Output Toolbox field. Click Run. When processing is complete, the result will display in ArcGIS Pro. To run the script, go to the Windows Start menu and select ArcGIS > Python Command Prompt. The toolbox name is the same as the engine name if no option is provided. The output directory defaults to the current directory if no option is provided. © Copyright 2017 Exelis Visual Information Solutions, Inc.. Revision a2ff20f3.